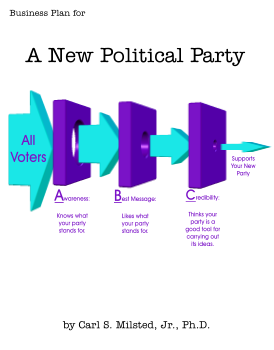 When we first looked at radical parties, I made the game artificially easy for radical political parties by considering two-way races. The scenario becomes grimmer for a “Party of Principle” when we look at three-way races. Consider a far left Green, a liberal Democrat and a conservative Republican in a three way race in a liberal district. 1. Democrat gets squeezed/Republican wins. This has happened. Without Ralph Nader, Al Gore would have been president in 2000. 2. Democrat moves to the right to make up for lost Green votes. With a bell shaped vote distribution, there are move votes to be won to the right of the Democrat than the left. 3. Green wins. This could happen if the Democrat moves too far to the right, the Green candidate isn’t too radical and the Green candidate has the money, celebrity and volunteers to get the votes the chart above indicates. 4. Democrat returns to her base. 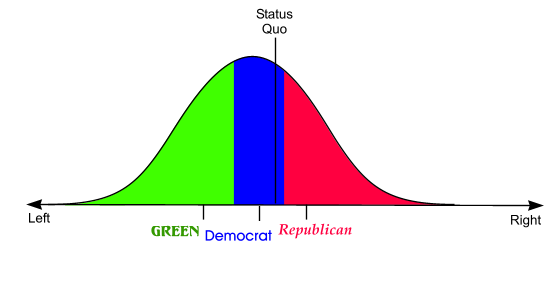 If the Republican is sufficiently conservative, the existence of a Green candidate could cause the Democrat to move to the Left to preserve her base. The first two outcomes are detrimental to the Green cause. The third outcome is unlikely. 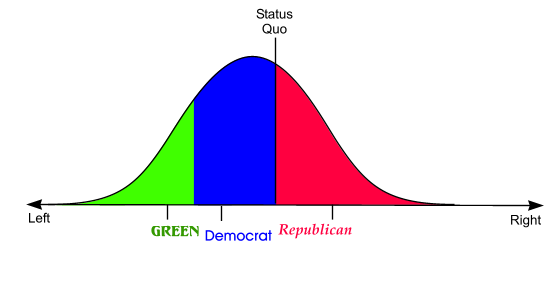 The fourth outcome is beneficial to the Green cause but detrimental to the Green Party. The Green Party is small and weak, which means that the third outcome is extremely unlikely. Therefore, the only positive outcome for supporting the Green Party in this scenario is for the Green candidate to be a suicide gadfly to move the Democrat back to the left – which keeps the Green Party small and weak. So much for party building. If you don’t see a dime’s worth of difference between the Democrats and Republicans, and you like the Greens, then it is in your interests to support the Green Party. Ditto for the Libertarian or Constitution parties. But who fits this criterion? And this is why long-running third parties tend to be filled with radicals. Whereas radicalism ensures electoral failure, it does help ensure institutional survival. Radical third parties march on wait for that day when The People wake up, Atlas shrugs, thesis meets anti-thesis, or we discover that Soylent Green is indeed made of people. Until then, the two legacy parties win nearly all the elections and political scientists teach that successful third parties are impossible under our current system. But success is possible, if you look at the political map in two dimensions.